Here is what literally no one talks about, but do you know that the secret formula to find your foundation shade lies in the knowledge of undertones! So lets find out what undertones are all about. Check the color of your wrist veins under the natural light of the sun. Broad daylight is the best sort of lighting to determine your undertone. The color of the wrist veins determine the undertone. Neutral Undertone: The veins look bluish green, especially when you can’t decide whether your veins are exactly blue in color or green. If only silver jewelry looks good on you, then you have cool undertone. If both silver and gold jewelry looks good on you, then you have a neutral undertone. If only gold jewelry looks good on you, then you have warm undertone. All the foundations of good brands are divided according to undertones. 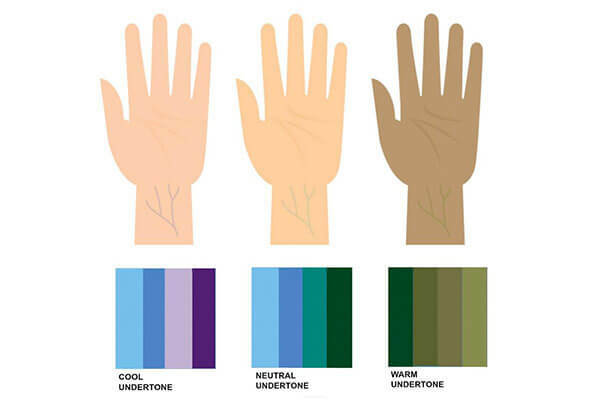 So once you get to know your undertone, the next step is to find the shade card of your desired foundation brand, and then select a shade from the section of your undertone, that matches your skin tone. In conclusion, undertones are not how dark or lighter is your foundation. A foundation one shade lighter or darker than your skin tone is likely to merge into your natural skin tone, but if you are pale(neutral undertone) and your foundation is pink toned(cool undertone), then that foundation will never merge into your natural complexion. This is what undertones are all about!